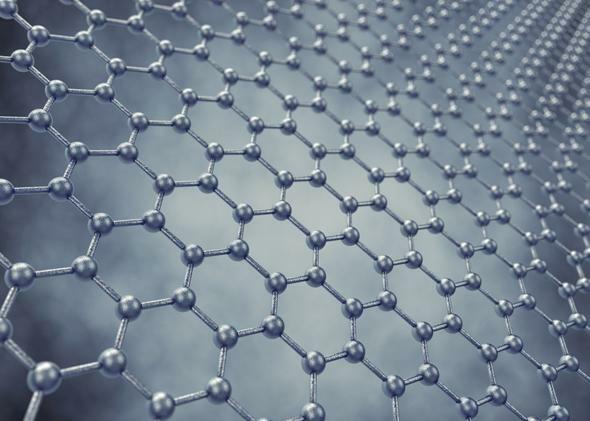 Blending graphite and soap in a blender can make high quality graphene according to Nature. An illustration of a graphene sheet at the atomic scale. Graphene, everyone’s favorite nanomaterial, holds promise for many different fields. The problem is that a single layer of carbon atoms is difficult to mass-produce at high quality. But a paper published Sunday in Nature Materials proposes a new method for manufacturing it, and all you need is graphite powder, some dish soap, water, and a blender. A group of Irish researchers from Trinity College Dublin found that adding lubricant to the graphite and agitating it in a device like a blender (in this case, a laboratory mixer) allowed the sheets of graphene that make up the graphite to slide apart. They also tested the method with an actual home blender and Fairy Liquid, a dishwashing liquid sold in the U.K. And it worked! When the researchers examined the mixture with an electron microscope, they found high-quality graphene. You need real lab equipment to get the proportions of the mixture right and then do anything with it after it goes through the blender, so it’s probably not actually worth trying at home. But the team’s funder, the chemical firm Thomas Swan, is enthusiastic about the finding and is already working on ways to harvest the graphene produced from this method. Jamba Juice probably won’t start making graphene alongside your raspberry smoothie any time soon, but maybe it should consider this an opportunity to diversify.